We believe in putting you, our customer, first in price and high quality printing services. Romeo Printing delivers the best product at the lowest cost and we are responsive to your needs. We don't use gimmicks and so called sales. Instead, we pass honest savings on to our customers at all times because we want to be your go-to local printing company. Our prices are fair, honest and, in most cases, the lowest in our market area. There is more to high quality printing services than simply accepting files and producing a quality printed piece. We believe in taking an active role in each project. Whether it is making suggestions to improve the look and effectiveness of your project or providing you with cost-saving alternatives, you can be confident that we will ensure that your finished product will meet your standards of quality and delivery. At Romeo Printing, we are passionate about the entire printing process, and we are eager to share our experience and expertise with our customers. Our in-house print production operation takes advantage of the latest technology, enabling us to deliver the highest quality invitations (including high-quality wedding invitations), business cards, book printing, label printing, and other projects quickly and inexpensively. See the difference for yourself when you trust your high quality printing needs to Romeo Printing. Established in 1983 as a family run, basement business, catering to large industrial and commercial businesses. 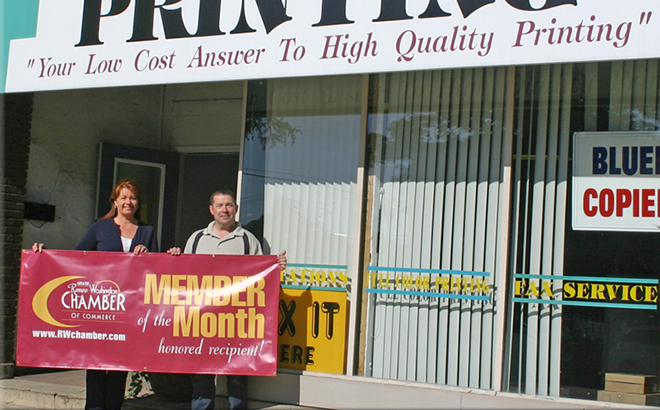 Although we have since expanded to our current location at 225 N Main Street, we are still a family run business with over 50 years experience in the printing and graphic arts industry. We are very proud of our reputation and do everything possible to insure our customer's satisfaction with our products and services. Think of us as your Macomb County printer. And remember that we now have blue print copying abilities!